When I call myself a moral realist, it's this kind of a picture I have in mind. I agree. Harm is harm. And if one doesn't understand what 'harm' means then one is confused about the concept of harm. Harm is harm. Ok, that's in the "exogenous space," but I think Pinker is thinking of more interesting things like "persons shouldn't try to own each other". You can try to explain why people arrived at that thought in lots of ways, but there's something to be said for the idea that personhood and ownership are just not compatible in the nature of things. So after enough smart, rational people thought about this and discussed this long enough, they were bound to come to that conclusion. I think that's a very compelling picture of moral discovery that's at least worth considering seriously. I'm always really cautious about thinking of morality objectively... This talk about moral discovery doesn't seem to mirror things like mathematical discovery (probably the best example of realism). They certainly aren't universal truths like math is... are they? Rather it sounds like a discovery of a consistent train of ideas. I believe that harm is wrong, and unnecessary suffering is wrong, and from these ideas I can see that it is consistent to reject things like torture. If its just a group of intellectuals coming together and agreeing, then wouldn't that just be a kind of specialized oligarchy? Appeal to the popularity of intelligent people? Its surely not that intelligent people come to the same conclusions, but rather the reasoning that they utilize. But in ethics, it isn't clear that intelligent people do come to any real consensus about things... because they diverge on fundamental issues (unlike in math where everyone is in agreement on basic axioms). "X possesses personhood (i.e. the ability to understand yourself, consciously, as a being with a past and a future) & X is owned by Y (i.e. Y has certain rather sweeping property interests in X)" sounds awfully clinical, but it doesn't sound like it is analytically false. So I don't think personhood and ownership are logically inconsistent, if that's what's meant by incompatible. It looks to me more as if people couldn't fool themselves anymore than people subordinated to the extent of being enslaved were anything other than miserable (as a generalisation), and the various rationalisations for inflicting that kind of misery became less and less compelling or even plausible. Maybe there's a bit more to it than that. Most of us are appalled not only by misery but also by the sight of people who are "happy" but only because of adaptive preferences. Pinker says "the universe of ideas, in which one idea entails others, is itself an exogenous force, and once a community of thinkers enters that universe, they will be forced in certain directions..."
So--how's this supposed to work? I'm not sure, but I doubt he means to say it's "analytic" that persons can't be owned, or logically inconsistent to say "John is a slave and John is a person." If you said such things, then it would become unclear why it takes people time to discover these things. I think maybe the idea is that the universe of ideas is like the universe of numbers--hard to penetrate, but with its own inherent structure. I used the word "incompatible" -- to suggest a relationship that doesn't meet the eye immediately. When people say determinism and free will are incompatible they don't mean to say it's logically transparent or analytic that an action can't be both free and determined. 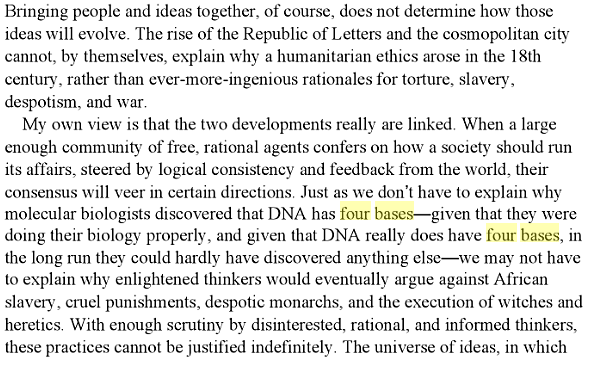 It's something it would take a great deal of argumentation to show, but still "the universe of ideas" is an exogenous force. We're going to come to see what's true here, if we give it enough thought. Well anyway...I like the idea of ideas as an exogenous force. I think it may even be the truth. They may be incompatible in some sense - after all, I think that science and religion are incompatible in some sense. Or at least I think it's misleading to say, "Science and religion" are compatible. I can certainly see arguments to say that ownership and personhood are incompatible, though they have to go via certain attitudes, values, etc. I guess I'm just making the point that notions of compatibility/incompatibility may be a bit complicated and may not be "knock-down". Which I think is kinda what you're saying as well. We may be in agreement about this. Or at least I think it's misleading to say, "Science and religion are compatible." I watched a video talk by him on his book and he seemed to be saying that people are evolvng rationally, that being rational = being more ethical and empathetic, but I wonder if that's true. In Athens around the time of Pericles, for example, there were rational thinkers - Socrates, Plato, Aristotle - and yet at the same time there were also slaves, and not slaves that were considered non-people but slaves who were just unlucky enough to have been on the losing side in battle, like the people of Melos. We need something to guide us to the opinion that harm/misery of others is in some sense a situation not worth aiming for but one to be avoided. That cannot come purely from reason.